According to the police, after investigating the incident, no gun was found/used. His "backtracking" comment is wrong. too. Again, an irresponsible comment by the police chief in my opinion. Lake Mary, Fla., police chief Steve Bracknell has distanced himself from comments he made in a response to an email from a town resident who was upset that George Zimmerman has not been charged with any crimes following an altercation Monday with his estranged wife and her father. In a Sept. 10 response to Lake Mary resident Santiago Rodriguez's strongly-worded emails, which called Zimmerman "a ticking time bomb... [and] a Sandy Hook [or] Aurora waiting to happen," Bracknell initially replied "I agree." On Thursday, WTSP reported that the chief walked back his comments about Zimmerman. "Chief Bracknell distanced himself saying he was 'referring to the fact that [Zimmerman] seems to be involved in incidents' involving firearms," the station reported. Requests for comment from the chief by The Huffington Post were not immediately returned. In my opinion, his agreeing to the email comment was irresponsible for a police chief. Yes, it's irresponsible imo, and possibly the basis for a lawsuit imho. Angela Corey continues to call George Zimmerman a "murderer." Now, "to quell racial tension," some want her removed from a new case in which a white teen is charged with killing an unarmed black teen. Before Corey made national news by charging Zimmerman with murder for killing Florida teen Trayvon Martin, the state attorney was no stranger to calculated risks. She had already made a 12-year-old face first-degree murder charges. She also put a woman in prison for 20 years for firing at, yet missing, an allegedly abusive husband, the prosecutor's office says. Now, a growing number of critics describe her as a desperate prosecutor who regularly overcharges defendants and is more interested in making a name for herself than in seeking justice. "She had the worst reputation in Florida for overcharging and the worst reputation with professional responsibility," said Alan Dershowitz, a Harvard Law School professor explaining why Corey should not have tried the Zimmerman case. "There are some great prosecutors in Florida and across the country. She's not one of them." Supporters of Corey say she is a solid attorney whose 32-year career as a prosecutor has led her to understand the law and how to effectively apply it to everyday situations. Corey was elected in 2008 as the state attorney for the fourth judicial circuit in Jacksonville. But long before she became a household name, her supporters say she became known locally as a passionate advocate for victims. Still, Dershowitz, one of Corey's most outspoken critics, contends that Corey gives prosecutors a bad name and published half-truths in an effort to convict Zimmerman. He adds that Corey has a reputation for firing her own employees who criticize her, and that in the aftermath of the phone call, a whistle-blower e-mailed him and said Corey was "trying to find something on you." However, some of Corey's critics claim the state attorney charged Zimmerman and others for personal gain rather than because the case merited a second-degree murder charge. "She thought it would look great, look how tough I am," said former Florida state attorney Harry Shorstein, who fired Corey when she worked as an assistant state attorney for him. "Very simply, if you follow the law and the facts, there was no question about the verdict." Shorstein told USA TODAY that he fired Corey in 2006 after a law school intern "complained very, very significantly about Angela Corey." Corey has said she was fired because she had announced her intention to run for state prosecutor to replace Shorstein. Meanwhile, Corey has continued to call Zimmerman a "murderer" and has used the opportunity to point to all the other cases she has won. "George Zimmerman used excessive and deadly force and that's what made it a violation of Florida law," she said. Assistant State Attorney Bernie de la Rionda, an attorney who works for Corey and who argued the Zimmerman case at trial agrees. "We were convinced that Mr. Zimmerman needed to be prosecuted." Shorstein described the selection of Corey to lead the Zimmerman trial as a mistake and said the prosecution's case was "atrocious." Dershowitz maintains that Corey overcharged Zimmerman and purposely left out in charging documents that Zimmerman had sustained injuries during a struggle with Trayvon. Several legal experts during and after the trial say prosecutors had little evidence with which to work. There were no real eyewitnesses, contradictory statements from nearby neighbors, and experts who seemed to support Zimmerman's version of events. Still, some claim Corey and her attorneys did a poor job of executing their case. Corey's critics have pointed to her 2011 decision to charge Cristian Fernandez, then a 12-year-old, as an adult with first-degree murder in the beating death of his 2-year-old half brother. Corey says she charged in the manner she did to ensure that Fernandez got enough time in the system to get the help he needed. "The juvenile system is not designed to handle a juvenile murderer," Corey said. "We were going to put him into adult court to seek a middle ground." A plea deal reached in February placed Fernandez in a juvenile facility until 2018 for lesser charges. Fernandez will be 19 when he is released, though still on probation. Henry Coxe, Fernandez's defense attorney, says his client was mistreated by Corey's charging. "He was 12 years old," Coxe said. "He never intended that his brother would be hurt seriously, that his brother would die." Of the murder charge, Coxe added: "We have never been able to fathom how that happened." Recently, Corey has come under fire from the Florida Civil Rights Association, which says it aims to advance equal opportunity and diversity. The association is calling for Corey to be removed from the trial of Michael Dunn, who has been charged with first-degree murder for shooting unarmed, 17-year-old Jordan Davis at a Jacksonville gas station. Davis, who was black, was sitting in a vehicle in November 2012 when Dunn, who is white, fired at the teen after an argument about loud music coming from Davis' car. The group says a special prosecutor is needed in the Davis case "to quell racial tension" created by Corey and the state attorney office's "failed prosecution" of Zimmerman. "Given her track record and how she handled the case to begin with, people would be better served if an independent prosecutor was appointed to that case," said Shayan Elahi, a civil rights attorney for the Florida Civil Rights Association. BTW, what is "agreeance"? Does the author of the article mean "agreement" Jeesh. Lake Mary Police Chief Steve Bracknell backtracks after saying he agrees George Zimmerman is "Sandy Hook... waiting to happen"
St. Petersburg, FL - Lake Mary Police did not charge George Zimmerman following a confrontation with his estranged wife and father-in-law. In a 911 call placed on Monday, Shellie Zimmerman can be heard telling the operator that George Zimmerman smashed an iPad and punched her father in the nose. Lake Mary resident Santiago Rodriguez, upset that police failed to file charges, fired off a strongly worded email - criticizing the department and Zimmerman. Rodriguez calls Zimmerman a "ticking time bomb" and says he's another "Sandy Hook" waiting to happen... apparently comparing him to someone capable of a mass shooting. In response to the email dated Sept 10th, 2013, Chief Steve Bracknell said "Your reference to Sandy Hook... I agree." The emails were published on the website, thinkprogress.org. When contacted by the site for comment on his initial agreeance, Chief Bracknell distanced himself saying he was "referring to the fact that [Zimmerman] seems to be involved in incidents" involving firearms. Links to listen to 911 call and read email in article. BTW, "agreeance" really is a word. It's just not used much. Just read on fb that Shellie has been arrested in the incident involving George and her and her father a Few days go! The iPad images and camera around the house show that Shellie was the aggressor! Gain, as they say, George was tried unfairly in the media. Cookie, I haven't found a reliable media source (I know, it's getting hard to use reliable and media in the same sentence ) for Shellie's alleged arrest per your post reporting you read it on FB. Keeping in mind anyone can post anything on FB, it may or may not be true. That doesn't mean she hasn't been arrested, it just means right now I can't find anything to substantiate that, so it's just a rumor at this point imo. Let's see what happens. It's the house where Lake Mary police responded Monday to a report of a domestic dispute between the couple. But that was for a short period of time. On Sept. 5, according to GPS records at the Seminole County Sheriff’s Office, the couple moved for the last time. It was into the large house not far from the courthouse, according to George Zimmerman’s drivers license records. 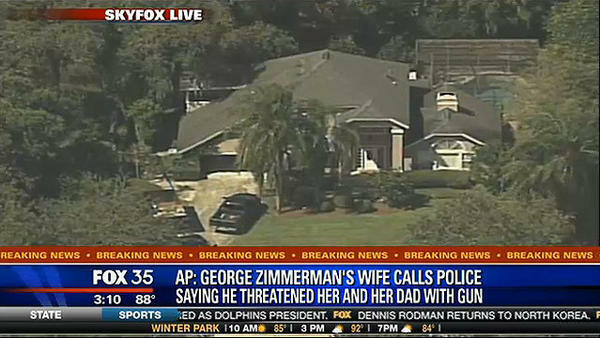 The home is owned by Shellie Zimmerman’s parents. The house is at the end of a quiet street of similar homes and is surrounded by woods on three sides. It is the house where police took Zimmerman into custody Monday after Shellie Zimmerman called police saying her estranged husband had threatened her and her father with a gun, a claim denied by Zimmerman’s lawyer Mark O’Mara. Zimmerman’s address became public last week after a Lake Mary police officer pulled him over on Rinehart Road and gave him a ticket for driving 60 mph in a 45-mph zone. According to Shellie Zimmerman’s divorce petition, they separated Aug. 13. They had lived together in the house until earlier this month. Zimmerman still lives there, O’Mara said. The Zimmermans paid $1,000 a month rent, according to statements previously posted about his legal-defense fund by defense attorney Mark O’Mara. The house has more than 2,500 of livable square feet and a market value of $240,000, according to the Seminole County Property Appraiser. The house was built in 1990, and the backyard is dominated by a two-tier pool and spa with four water jets shaped like lions’ heads. Also in the backyard is a patio with a second-story deck. trying to find a place that would have them, that would be safe and that was in Seminole County, according to a lawsuit filed against Zimmerman by former bodyguards. dang it! I hate when the news is not accurate! i can give u the name of the news article. not able to copy/paste myself. why don't we just delete my post for now cause I do not want to pass on false info! I hate that! was on National Report...probably is fake.. It's fake cookie. "National Report" reminds me of "The Onion". Satire. Entertainment. Grrrrrr! I hate that! It only adds confusion and false stories! I deleted it off my fb page and told the guy who passed I on to me that it was fake. I got it from a guy who is usually pretty savvy. I wouldn't worry about it cookie. It's annoying, but no real harm done. Jorge Estevez's hips don't lie, which is another asset for a TV anchor. Estevez of WFTV-Channel 9 won Orlando's version of "Dancing With the Stars" Saturday night at Hard Rock Cafe. Orlando attorney Mark NeJame won an online popularity vote over the other five competitors, who included Dr. Jan Garavaglia of "Dr. G: Medical Examiner" and attorney Mark O'Mara, who represented George Zimmerman. O'Mara told WFTV anchor Greg Warmoth, a host for the event, that doing the Zimmerman closing was easier than dancing a fox trot. "I didn't practice that. I had to practice this," O'Mara said of the dancing. O’Mara placed sixth in the judges’ standings. Ranking behind Estevez were Orlando attorney Diana Tennis, banking executive Barb Scherer, NeJame and Garavaglia, Orange-Osceola chief medical examiner. Garavaglia, who was celebrating her birthday, gave a dramatic performance on the pasodoble. The judges applauded her passion. NeJame, an analyst for CNN, displayed some frisky moves on the mambo to surprise the audience. He shook his hips merrily and ripped his shirt open (twice) to execute a belly roll. The judges gave him extra points for flashing the flesh. It's sad that George and Shellie are estranged. All the consequences of that fateful night go on forever. Yes it does go on and on Jamcakes.